A little bit of snow didn't stop Tony and Rona either. They were out on the 4th January. In the stunning aerial picture, if you ask was it cold, I would say yes - bl**dy cold, but those are thermal clouds in distance! Here's a group of trainees about to take launches. It was on an occasion like this that I diverted to Newmarket instead of heading straight up to Sculthorpe, to pick up a new student. Kathy Rigg trained with Tony and Rona and went on to great things (see her page) - recently back after a five year lay-off taking 3rd place in the Women's World Championships in Monte Cucco. 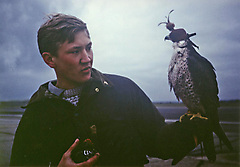 Other vistors to the field were bird and man: Andy Hollidge - at this stage not (I think) a pilot, but clearly besotted with avian capabilities. 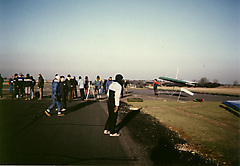 Now a fully fledged pilot for many years, he has (September 2008) topped the National XC League tables, and has lifted the Cambridgeshire Aerotow Club (a descendant of the Norfolk Aerotow Syndicate) to the top of the Club league for the first time ever. Towards the end of January we trooped off to RAF Barkston Heath near Grantham for a BHGA tow meet. During my first take off (captured on telly) in the beautiful smooth but frosty air I lost it somewhat, and allowed one wingtip to touch the ground. Fortunately Phil - the winchman - had enough experience to keep the towline tension on, which enabled me to straighten up and abort the take off without further ado. If he had cut the line at the first instant (arguably what he should have done) I would have cartwheeled into the ground and no doubt would have bent and broken numerous things. This incident sparked a "lively controversy" about towing techniques. 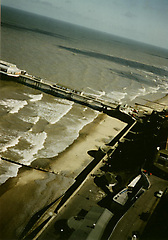 I went on to take a couple more satisfactory launches, and it was only when I myself saw the incident on telly later that my knees wobbled a bit. 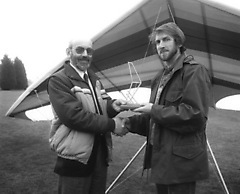 A small moment of fame (but one of considerable personal pride): Noel Whittall, the BHGA Chairman presented me with the Dave Loxley trophy for tow launched XC flights the previous year. Around this time, Tony and Rona made a big financial commitment to the purchase of a Koch static winch. This would liberate them from reliance on Sculthorpe (or other suitable runway sites that were increasingly hard to find). Access to Sculthorpe could have been withdrawn at very short notice - not a comfortable situation if you were running training courses. The static winch did things backwards, in my view. Instead of starting close to the (pay-out) winch - when you could shout at each other and see what was going on - you started off separated by about half a mile of wire. 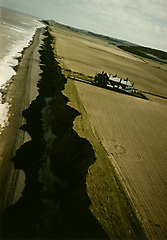 If there was a slight hump in the runway in between (there was), you couldn't see each other (properly), but of course you had radio walkie-talkies. So that was all right, or would have been, but what you needed were reliable radios, and mostly, these weren't. Furthermore, in order to generate the tension for launching, the winch wound in the cable making it shorter all the time, thus reducing the maximum height you could obtain, the longer you stayed on the towline. However, sailplanes had been using this sort of arrangement for a long time, and it soon became adopted. 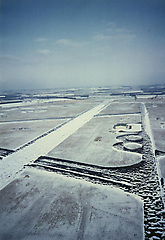 The great advantage was that such a system did not require a runway, and could be operated from a reasonably smooth grass field irrespective of the wind direction. The Koch winch had been designed around a Volkswagen motor engine (air cooled, you know). This made it serviceable, and affordable (just about) for small hang gliding groups. We couldn't have afforded the much more expensive and powerful specialist winches available to the sailplane community. I think SCFHGC acquired a Koch winch around this time, and in other areas of the country hang glider tow-launching became more accessible and accepted. 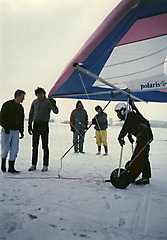 I took my first three launches with Tony and Rona at Sculthorpe on a day in mid-March 1986. Sorry - no pictures of the Tony and Rona with their winch from this era. During the rest of the year, recovery from the broken leg and concussion was eventful and protracted. After relinquishing crutches, my back went into spasm, then Valium given for muscle relaxation induced intense depression for months (I swear it did).